Forgiveness is an act of favor, compassion or love that can free a person from guilt and its consequences with the aim of restoring a broken personal relationship between two opposing parties. The need for divine forgiveness of sin, the practice of forgiveness by God’s people, and the application of forgiveness principles. A. The Disobedience of the man and woman that God created, Adam and Eve, introduced Sin into the world that God had created. The Apostle Paul tells us that sin entered the world through one man, and death through sin (Romans 5:12. The consequence of that sin was that it broke the spiritual relationship between God and His creation, and that includes you and me. B. Beginning at Mt Sinai, God ‘s remedy for sin was the institution of the covenant of Law. Sin was forgiven by the offering of animal sacrifices and the shedding of blood which prefigured the atoning death of Jesus Christ. (1)	God’s nature is to forgive because of His mercy and compassion. D.	Another example of God’s forgiveness is seen in his relationship with David. (2)	Because God is gracious and compassionate, He forgives David. E.	In the New testament God establishes a New Covenant through the death and resurrection of Jesus Christ. (1)	By virtue of Jesus’ sacrifice, there is now access to God and the forgiveness of sin. (2)	When men and women confess faith in Jesus Christ as Savior, He forgives them of their sins and declares they are righteous (justified). (1)	Our understanding of the power of forgiveness has its beginning with the nature of God. (2)	Because of His love and compassion, God is willing to forgive sin. (3)	Because God forgives, He wants His people to show love and compassion and forgive. God is our example of forgiveness. 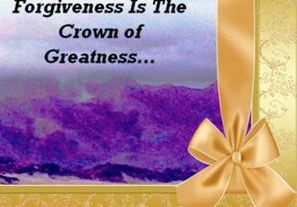 (4)	How do you show your appreciation for God’s forgiveness of your sins? After reading this blog, please let us know how you show your appreciation for God’s forgiveness of your sins. Also, please remember to come back next month to read Part 2 of this Blog. February is traditionally observed as the “Month of Love” and the time in which we celebrate Valentine’s Day. February, however, has also been designated as Black History Month and Heart health month. As I considered this month’s blog, it occurred to me that all these observances have a few things in common, love and the heart. Love and the heart you ask, Dr. Meg what do you mean? I am glad you asked. First, let’s start with the “Month of Love” aka Valentine Day. It is safe to say that no one can experience love unless their heart is involved. Would you agree? The word of God reminds us that the heart is desperately wicked, and as Christ-followers, we can affirm that until God changes our hearts, we cannot truly love anyone, but ourselves. In fact, I will be willing to bet that a genuine Christ-follower is often the most amazed at the changes that God has brought about in his or her heart, because honestly no one knows you as well as you know yourself. So, as you celebrate Valentine’s day whether you are single, married, divorced, or just a child, open your heart to feel the love of others, and most importantly, the love of your heavenly Father, who loves you more than anyone on earth. Close your eyes and feel that love and remember to celebrate by giving HIM praise. Next, let’s take a look at Black History Month! The theme for 2019 is "Black Migrations." The theme brings a focus on "the movement of African Americans to new destinations and subsequently to new social realities." So, I can hear your question, what has love or the heart got to do with black migration? In other words, what does the movement to a new destination or to a new social reality have to do with love and or the heart? Allow me to elaborate! While Black migrations did not originally start in love, it is clear to me that the movement of Blacks across the US and the world is in pursuit of love, better heart health, peace, and making a better life for future generations than we had ourselves. Take my life for an example, over two and a half decades ago, I took a step of faith and with the help of God and family, I uprooted my family to travel to America in search of better educational opportunities and a better future for my children. While love might not have been articulated in those dinner table conversations and prayer meetings, it was the driving force behind everything. For instance, my constant prayer to God was to help me not to be a generational thief with love as its linchpin, since I fully believe that a good man/woman leaves an inheritance to his children’s children. But, you might say what does love have to do with black migration in the U.S.A. Again, a good example of this love is the sharecroppers who left the south and headed north to escape overt racism and discrimination, and to build a better future for their families. Every move was oiled in love and as they left their original destinations, their hearts were hopeful that somehow their dreams for their sons and daughters to be treated fairly, given an equal chance, and treated with respect would come to fruition. Whether these dreams have been fulfilled is debatable, and I would love to hear your thoughts about this. But, I believe that the heart and the need for love and acceptance were, and still is, the impetus for black migration. As we move forward this month, let us continue to ask for God’s wisdom to guide all we do and say. Additionally, we must keep loving one another like it’s your last chance, keep a watch over your hearts and pray for African Americans as they work to find their rightful place in the U.S. and the world. Finally, please feel free to share your love, migration, and or heart health story with us during this month of love. Also, check back with us next month when we will examine heart health and forgiveness. Happy New Year to all of our readers, I hope that you are enjoying the year so far. Tell me if it is only me, but does it seems that 2019 is running on skates, and we are all working overtime to keep up? Yes, indeed, 2019 is moving at breakneck speed and I can’t believe that we are already celebrating MLK Junior Day. As usual, I wanted to take some time at the beginning of the year to do some reflection and to challenge each of us to stretch and grow this year. As I reflected on what to share, someone in one of our meetings shared this thought “this is the year where God will purge us, purify the remnants, and refine us” since its time to uproot all the mess in our lives. Wow, this was deep, but somehow the statement rang in my ear. It was almost like it was echoing from heaven! “Lord what does this mean?” I asked. As I waited, anxiously to hear more, I went into a season of consecration. As I fasted, journaled, and prayed, a few things started to become clear. 2019, it seems, will be a different year! From the weather, to the government shutdown, to other events of the year; thus far, I believe that nothing in our past has prepared us for what this year will bring. However, God in his wisdom is already preparing us for what’s to come, by starting a spiritual purge. Of course, no one comes willingly to a purge, since purges are often unexpected and unpleasant. But, when God orchestrates them, then I know that purges can be helpful. As I think about a purge, I have come to realize that I started the year moving, cleaning, clearing clutter, and as you might guess, purging my house of things we no longer needed. I also started a 21 day time of consecration, fasting from certain foods, and toxic relationships. This has meant spending more time in the word of God, more time praying, journaling, and worshipping. As I remain open to God’s purge, I am trying to be sensitive to the things HE is trying to purge, prune, or pluck out of my life. Once the purge ends, then I believe that God will move into a period of purification and refining. Purification means to remove contaminants. If God is purging us, it stands to reason that a season of purification of the remnants will follow. Therefore, we should expect to undergo a season of testing as God works to renew a right spirit within us, and to make us more like Him. Being more like God is almost impossible with hate, unforgiveness, bitterness, pride, injustice, anger, etc. in our lives. So, that is the intent of the purge, or so it seems. In other words, just as my guest stated at our meeting, “it is God’s time to uproot our mess”. The uproot has started, and so I am learning to not hold too tightly onto anything, but to keep a surrendered heart, and to be sensitive to the voice of the Holy Spirit. Praying Psalm 51, or other ways of asking God to purge me, has often been followed by God revealing things in my life, which I was not even aware of. Once these things are brought into the light I, first, have to face and acknowledge these issues, and next, I have to figure out what I will do about them. This purge calls us into accountability as well as into a united work with God, to figure out what goes or what stays. None of this is pleasant or welcomed, but I believe this to be a very good and necessary action as we step into 2019. Refining is the last stage of this process, and while I am not sure when this will start, it is clear that business as usual will not work in 2019. Toxic living, unrighteousness, unforgiveness and hate seem to be all around us, but God is calling us as Christ-followers to live at a higher level. He has high standards and while we are unable to attain them on our own, God is our strength and HE will give us the power to achieve the impossible, if we surrender to his plan and purpose and allow him to purge, purify, and refine us in 2019. After all, moving into a new year or a new relationship with mess, weighs us down. So, why would we want to continue doing the same thing and expecting different results in a new year? I bet that you will agree that it is time for drastic changes which begins with a purge, takes us through a period of purification of the remnants, and then refines us into a new life. This will position us well for everything 2019 will throw at us. Let the purge begin! Are you ready and how do you sense God might be purging you as you start this New Year? Please share your GOD story with us. As I sit listening to the firecrackers, it seems unreal that we are getting ready to celebrate the New Year. After all, I still can’t believe that we are at the end of 2018. How quickly the year has slipped by, and what a rollercoaster year it has been. Given all of what has happened this year, I face the next few hours with mixed emotions. First, I am eternally grateful to God for his provision, direction, protection, grace, and mercy in 2018. But, sad for some of the losses that have occurred this year. However, as I always do, I come to the end of the year in a very reflective mode. Here are a few thoughts that are brimming in my mind. •	2018 was my 25th year in this county. In 1993, following God’s prompting, I gave up my home and career to move to the USA to go back to college and to work towards my doctoral degree. This goal took me longer than I anticipated, but with Gods’ help this goal was finalized in 2013. •	2018 was my 14th year in my current home. God has kept us there, by continuing to provide all the resources we needed. •	In 2018, my family reunited after 40 years apart. •	2018 was the start of my 11th year in my current job, and the beginning of my countdown to retirement. •	2018 was the 40th anniversary of my high school graduation. •	2018 was the 40th year of work and the beginning of my career in public health. •	2018 was my son’s 37th birthday and my youngest daughter’s 19th birthday. •	2018 was the year my first granddaughter was born. •	In 2018, my eldest daughter married her high-school sweetheart and moved to Texas. •	In 2018, I was involved in a serious hit and run motor vehicle accident that had me incapacitate for almost six months. •	In 2018, my 30-year-old niece died in her sleep leaving two very young children. 2018 was indeed very stressful year, but one of many successes. As the New Year approaches, I am hopeful that 2019 will be an even better year. Most importantly, I am learning to turn over control of my life to God, and allow HIM to have his will and way in my life. Please share with me what you are grateful for in 2018. Here's to the best New Year ever! November has been an interesting month! For starters, in November, we as a nation held the midterm elections, made changes in Congress, witnessed the fires in California, stood in awe at the continued unrest at the US/Mexico border, and heard reports of several other shootings in the streets of our cities. America it seems was not slowly moving towards the end of the year, but there instead seems to be a continued spirit of unrest in our country. In my opinion, order and peace seem to evade us and instead there seems to be a constant stream of negative news at the local, state, national, and international levels. For many, as we ran to and fro for the recent Thanksgiving holiday, buying what we really did not need or could ill-afford, overeating, overspending, and for some overdrinking. It seems apparent to me that we all might need to collectively stop to unwind, figure out what is in our control, and take steps to ascertain how to best address the needs of our families, friends, and our immediate community. Not that the world is not our stage, but life is chaotic enough within our homes and communities, that if we were honest, we would say, we all have our hands full. To add to this spirit of unrest, on my side of the world, I lost a 30-year-old niece in November. What a blow! Death is never a welcomed visitor and we know that the grave is never satisfied (Proverbs 30: 16-19), but losing a loved one is never easy. It is worse when they are young and vibrant with young children. As humans, we have many questions, we blame ourselves, we think, and think again about what we could have done differently while going through the stages of grief. These stages are many and might not even be cyclical, but include denial, anger, depression, bargaining, and acceptance. So, I have moved through the phases and after much prayer and tears have found some semblance of peace, but know that our lives are never the same. So, how does one find peace and order in one’s life, whether their dis-peace is related to issues affecting the nation or death in one’s family? I believe that this happens in a few ways and I will share these here, but would love to hear from you about approaches that work for you as well. First, I think that it is important to realize what we can or cannot control. Whether wildfires, the election and its outcomes, or death in our families, these are all outside of our control. Next, we must continue to pray for our families, friends, leaders, nation and world, so that we can have a godly and peaceful life. Then, we must acknowledge the sovereignty of God over all things of creation. Often we can’t understand why we would lose a vibrant 30-year-old niece, but I have realized that there are some things that I will never understand this side of eternity. So, I have learned to trust God’s heart when I can’t see or understand his plans. Finally, I have learned to accept the blame if I am at fault, but work hard to quickly forgive myself and others, since life is short and living in unforgiveness about any issue or offense someone might have caused, is not an option. To secure our attention and place us on the pathway God desires, there are strategies that He employs that are very effective. We must be knowledgeable of the ways of the Lord (Ps. 25:4). Knowing God's ways will result in us experiencing His mighty acts (Ps. 103:7). The Apostle Paul had received an apostolic commission to preach the gospel to the Gentiles. In keeping with his mandate, he targeted key cities in the Roman Empire to visit. Yet, the New Testament narrative informs us that on at least one occasion he was not able to fulfill his objective because God saw fit to stop him. "They went through the region of Phrygia and Galatia and were forbidden by the Holy Spirit to speak the word in Asia. When they came near Mysia, they tried to go into Bithynia, but the Spirit did not allow them" (Acts 16:6-7). Like Paul the apostle, while attempting to do the will of the Lord, perhaps you were heading down a certain roadway and you ended up "hitting a wall" and were stopped in your tracks. From that point on, no matter how hard you worked, you were incapable of making significant progress. Initiatives and projects that were originally inspired by a lofty vision and deep passion ended up languishing, some of them even terminating. When stuck at an impasse, it is a natural tendency to return to familiar surroundings. We see this in the lives of the disciples after Jesus' death. They went back to fishing even though they had clearly been mandated to forsake their vocation and follow Christ (See Luke 5:10-11; John 21:3). Because they were commercial fishermen, there may even have been economic motives behind their actions. Nevertheless, we see clearly that there was no lasting provision and no permanent peace in returning to past environments. There are some breakthroughs reserved for us that can only be accessed through prayer. We must seek God until we receive a clear answer from heaven. Whether it was Paul's night vision of the man in Macedonia summoning him, or the voice of Jesus speaking to the disciples on the seashore in Galilee, the New Testament Christians received clear direction from the Spirit and were able to regain momentum and experience breakthrough. God wants us to move in a new direction, He may also permit us to experience the dissipation of resources. Elijah had been powerfully used by the Lord to declare prophetically the purpose of God in dealing with Israel. "And Elijah the Tishbite, of the inhabitants of Gilead, said to Ahab, "As the Lord God of Israel lives, before whom I stand, there shall not be dew nor rain these years, except at my word" (1 Kin. 17:1) And just as the prophet had foretold, the word of the Lord came to pass. "And there was a severe famine in Samaria ... "(1 Kin. 18:2). During the famine, God looked after Elijah. He gave him specific instruction relative to how he would be sustained. "Then the word of the Lord came to him, saying, 'Get away from here and turn eastward and hide by the Brook Cherith, which flows into the Jordan. And it will be that you shall drink from the brook, and I have commanded the ravens to feed you there.' So he went and did according to the word of the Lord, for he went and stayed by the Brook Cherith, which flows into the Jordan. The ravens brought him bread and meat in the morning, and bread and meat in the evening; and he drank from the brook" (1 Kings 17:2-6). Cherith which means "place of covenant," was where the Lord demonstrated His faithfulness in taking care of Elijah. However, the day would come when the brook would run dry and the birds would no longer fly (see 1 Kin. 17:7). Although Elijah had come to depend on such provision, God seemed to have no compunction at all cutting off these resources. Have you experienced something similar? Your streams of resource have dried up. You struggle to make ends meet and you do not know how you are going to keep going. During such a time, trust that the Lord will soon speak to you as He did to Elijah. "Then the word of the Lord came to him, saying, 'Arise, go to Zarephath, which belongs to Sidon, and dwell there. See, I have commanded a widow there to provide for you'" (1 Kin. 17:8-9). More than a cute cliche, you will see that the place where He leads you will be the place where He feeds you. Where the Lord guides, He provides! Please feel free to share any experience you might have had with God’s redirecting your life. On September 22, 2018, our ministry will host its first local Forgiveness and Wellness Conference in Decatur, GA. This is quite timely as September 21 was the International Day of Peace, or more informally called “World Peace Day”. World Peace Day is a United Nations sanctioned observance and nations across the world stopped today to celebrate peace and to uplift the concept of “the right to peace” which is the 2018 theme for this 70th observance of this day. On this day, I pause to share Dr. Desmond Tutu’s statement that “stability and peace in our land will not come from the barrel of a gun, because peace without justice is an impossibility." Do you agree? I do! Whether in South Africa or in these United States, peace will only come when we love, forgive, and uplift one another, not through by verbal, physical, or other battles. We could not agree more that everyone has “the right to peace”, and so in our small way, we will be working to touch the lives of more than 100 participants at this inaugural Forgiveness and Wellness Conference. Interestingly, attendees will come from a variety of denominations, religions, states, and cities to congregate in Decatur for this event. Presented by an esteemed and diverse faculty, the conference kicks off with all attendees completing a forgiveness assessment which will be followed by an interactive workshop on forgiveness which will discuss the biblical concept, the physical benefits of forgiveness, what is unforgiveness and its health implications, etc. Later in the afternoon, the conference will address issues around stress and anger management, mindful eating, brain health, managing your money, relationships, and prayer life after transgression. The day will end with a sacred event and tools to continue the forgiveness process. Answer: When a Christian woman is looking for a husband, she should seek a man “after God’s own heart” (Acts 13:22). The most important relationship that any of us have is our personal relationship with the Lord Jesus Christ. That relationship comes before all others. If our vertical relationship with the Lord is as it should be, then our horizontal relationships will reflect that reality. Therefore, a potential husband should be a man who has his focus upon walking in obedience to God's Word and who seeks to live so that his life brings glory to God (1 Corinthians 10:31). What are some other qualities to look for? The apostle Paul gives us the qualities we should look for in a husband in 1 Timothy chapter 3. In this passage are the qualifications for a leader in the church body. However, these qualities should grace the lives of any man who walks “after God's heart.” The qualities can be paraphrased as follows: a man should be patient and controlled in his demeanor, not filled with pride but of sober mental attitude, able to master his emotions, given to graciousness to others, able to patiently teach, not given to drunkenness or uncontrolled use of any of God's gifts, not prone to violence, not overly focused upon the details of life but focused upon God, not apt to be a hot-head or be thin-skinned so that he takes offense easily, and grateful for what God has given, rather than envious of what gifts others have received. Finally, when “looking” for a husband, we must be surrendered to God's will in our lives. Every woman wants to find her “prince charming,” but the reality is that she will probably marry a man with as many flaws as she has. Then, by God's grace, they will spend the rest of their lives together learning how to be a partner to, and servant of, each other. We must enter into the second-most-important relationship of our lives (marriage), not under an emotional cloud, but with eyes wide open. Our most important relationship, with our Lord and Savior, has to be the focus of our lives. I can’t believe that we are in the middle of June since it seems like only yesterday we were busy celebrating the New Year. June is a busy month, and so far, June 2018 has lived up to these expectations. June seems to be the month for weddings, graduations, family reunions, and vacations. Vacations and all these celebrations are timely breaks since we have all been running at a neck-breaking pace over these five months. So, as the temperatures are rising, it seems to make sense that we stop this June to celebrate our brides, graduates, family, take time to slow down and take a break from our daily grind. As I have gotten older, I have learned that I no longer have the resilience or the ability to do an all-nighter and bounce back like I did when I was in my teens. Life sure has a way of slowing us down. Of course, slowing our pace is important for healthy living, making good decisions, and good quality of life. Surprisingly in these United States, our culture does not support setting aside time each day to slow down. In countries such as Spain, these periods of rest are built into businesses and the fiber of a society. I wonder what would happen if Americans took an hour off each day for a nap. I would predict that we would have a healthier population with better quality of life. But while we wait for the nation to catch up to the idea of slowing down, I would like to suggest that this is something we can start in our own families. So, join me in taking off even a day per month to do nothing but relax, take a nap in the middle of the day (definitely on Sundays if you can), or just take a nature break. Any or all of these will refocus us, clear our heads, and increase our effectiveness and efficiency. In 2018, we have no one in our family graduating from college or high school, but for the first time, my little family is planning a wedding. As the days tick closer, fear turns into trepidation, then excitement, then surprise, and cycles back to fear. I find myself constantly asking if this real? Is my child ready for this next step? Have I prepared her for a long-lasting relationship, despite my many flaws? As the anxiety heightens, I have learned to stop to take any “dispeace” to God, and as I do, my fear slips away. Fear (False Evidence Appearing Real) is a liar, and the Lord continues to remind me that he loves my daughter more than me. In addition, he has plans to prosper her and not to harm her. So, despite my anxieties, fears, apprehension, etc., I am learning to surrender everything to God. Once this happens, real peace and joy returns that no one, not even a worrier, can understand. As I get ready for the big day, I wondered what advice I will offer. What will I say? So, I thought that I would consider doing this blog to get my creative juices going. Say a prayer that I will be ready to contribute with a few pearls of wisdom in the next four weeks. Here are some great tips on marriage that I have picked up along the way; I truly believe that these will be helpful for my daughter, all the brides, and bridegrooms that will take their vows in 2018. Here are my pearls of wisdom on marriage that I will share. Tell me what you think! •	A good marriage has three parties: a bride, a bridegroom, and GOD. •	A good marriage is a prize. You don’t get it for nothing! •	Trust, respect, and honor your spouse. You chose them, and now you are united as one. Add value. Do not detract from them. •	If you have to criticize, do it lovingly. Be steel wrapped in velvet. •	At least, once each day, try to say one kind, complimentary thing to your partner. •	God has your back since he instituted marriage. Lean heavily on him. He knows everything, so why worry when you can pray. So, pray about everything TOGETHER. •	Marriage is harder than it looks. When two imperfect people come together, smoke will rise first before peace comes. •	Never bring up mistakes of the past. Forgive and forget. •	Never yell at each other unless the house is on fire. •	Never go to bed angry at each other or with an unsettled argument. Talk about your differences, kiss and makeup. But don’t give the devil the opportunity to cause any division in your home. •	If one of you has to win an argument, let it be the other one. •	Neglect the whole world rather than one another. For who can bear loneliness in a marriage. •	Find a couple in a wonderful, long-lasting marriage, ask them to mentor and provide support to you on this new journey. •	There is no more lovely, friendly, and charming relationship, communion or company than a good marriage. •	God created the first marriage, ensure you are in his perfect will before saying I do; he wants you to be happy. •	Don’t expect your partner to make you happy. If you are not happy alone, you will just make your spouse unhappy. •	When you have done something wrong, be ready to admit it and ask for forgiveness. •	Finally (my absolute favorite from Dr. Myles Munroe) you must remain single, unique, and whole in your marriage, so that your marriage can thrive. I believe that as we slow down this summer to celebrate marriages, couples should consider following these tips for a happier ever after. By the way, do you have tips that you share with the newly married? If yes, please share these on our Blog this month. Congratulations to all of our brides and grooms. May is a busy month for all of us as we move into the summer. During this month, we will celebrate many health observances, including, national mental health month, high blood pressure education month, women’s health month, healthy vision month, lupus awareness month, national women’s checkup day, etc., and of course Mother’s Day. May is also the month when as a nation, we celebrated the National Day of Prayer (every first Thursday of May) where all Americans were encouraged to stop to pray. We have much to pray for a nation and we should be praying without ceasing since these are troubling times. A prayer request that should be constantly on our lips is a prayer for all of our mothers. In fact, have you ever met anyone who never had a mother? I am sure the answer is no since all of us have or have had a mother. Whether they are still alive, dead, or estranged from us, we all are here because we have mothers. In 2016, the Centers for Disease Control and Prevention (CDC) reported that as a nation we witness 3,945,875 births. All these 3,945,875 new moms joined the other existing moms of our nation, to care for, love on, and protect millions of Americans. As I reflected on May and the various health observances, I could not help but wonder how the mothers of our nation are managing their health, regardless of where they find themselves. In fact, I think this is a timely conversation, given our upcoming Mother’s Day. Honestly, I think, given their huge role, I think it is about time that we spend some time praying for and celebrating our mothers, whether they have no existing chronic conditions, lupus, mental health conditions, high blood pressure, vision impairment, etc. As mothers, we are guilty of always caring for others, and unfortunately we often wear ourselves thin putting our families before ourselves. As moms, we invest heavily in our children, spouses, and families, but we don’t take time to take care of ourselves. Anyone else found guilty of this except me? I doubt it and as mothers, I think that we can all relate. So, given this truth, I wanted to stop to salute all our mothers and to issue a call to action for all of us collectively, to take better care of ourselves. Dr. Meg, you ask how I do that with all that is on my plate. I am glad you asked. Here are a few suggestions for the consideration of our readers who are mothers. Try these tactics and let me know how they work for you. 1. First, start your day with prayers and a time of meditation, to center yourself and to set your day off on the right footing. 2. Eat a healthy breakfast with low- fat proteins, complex carbohydrates, and healthy fats. 3. Drink lots of water and limit sugar-sweetened beverages in your diet. 5. Work to get at least seven to eight hours of sleep each night. 6. Keep physically active by finding some physical activity that you love and engaging in this for at least 150 minutes each week. 7. Find a friend that you respect and trust and someone with which you can share the ups and downs of your life with. Meet often to check in, talk, connect over a cup of coffee or tea, or just cry together. 8. Ensure that you receive all your preventative health care services, such as mammograms, pap smears, vision screenings, check-ups, etc., to take care of you. 9. Find time to de-stress when things get hectic, and work to find joy in whatever you do. 10. Set boundaries in all your relationships, and learn how to say no. You will be unable to please everyone, so stop trying to do so. 11. Take time for yourself. Run a bath, paint your nails, take a nap in the middle of the day, read a book, or sit and do nothing. I know that this is a novel idea, but life is not always about doing. It’s time to just be! 12. End your days with prayers and meditation. Journal as you pray and before you know it, you will be a healthier you. Take some time to try these tips and let me know how they work for you. I am working through the list myself, and believe that this will make me a better mom and grandmother. Also, if you have other tips that work for you as a mother, please feel free to share these with us as well. Enjoy your Mother’s Day and remember to find time to take care of you. Here’s to good health for all our mothers.